In 2008, I was living in Paris. One morning of February, I got on the Eurostar to go and see Pina Bausch’s Café Müller and The Rite of the Spring in London. I had to honour my vow to meet up with the TanzTheater Wuppertal every February of my life. When I got off the train in the British capital, I walked a few steps on the platform, and my heart jumped. There was this tall, gracious and so familiar silhouette a few meters ahead of me. I travelled on the same train as Dominique Mercy, the most iconic dancer of the TanzTheater Wuppertal and long-life friend and muse of Pina Bausch. It is not in my habits to act like a groupie, but before I knew it, I started running to catch him up. I engaged conversation with him, in French, of course. He replied as if he wasn’t one of the most idolised dancers of the world who had been acclaimed for decades on the most prestigious international stages. I could notice that among the dance artists, the more talented and recognised they are, the more humble and putting themselves into question they seem. Huge artists are humanly fascinating. They are a different breed of people. I feel privileged to have received little inspirational pieces here and there. I asked him if he was ever teaching masterclasses. He said that he was sometimes invited at the Ateliers de Paris Carolyn Carlson as a guest teacher. We exchanged a few more words, and when our paths split, he turned at me and said “A ce soir!” (“See you tonight!”) What an exquisite human being. Equally beautiful on and off the stage. I started monitoring the program of the Ateliers de Paris Carolyn Carlson, and my patience paid off. In February 2010, two years after my lucky encounter at St Pancras International station with Dominique Mercy, I got accepted on a week intensive workshop he was teaching. That year, my February rendez-vous with the TanzTheater Wuppertal would be of the dancing kind. On the first day of the workshop, I arrived early at La Cartoucherie de Vincennes, an awesome theatre complex near the woods right outside Paris. We were starting in the morning with a technical contemporary class till lunch break. But we were going so much into the depth of the emotion and interpretation of the movement in each exercise that we ended up having lunch in the middle of the afternoon without realising. Time was suspended. We were magnetised. Every clue, every explanation that Dominique was giving us was a pure dance gold drop. Dominique was restless in class. He gave his energy without counting, although he was already 60 at the time. (He is 65 now and still performing.) When we were doing the exercises 2 by 2 in a diagonal, he was doing the movements full out with each group, and we were about 30 young dancers in the workshop. By the time each of us had done the routine once, he had done it 15 times without showing any sign of fatigue. He didn’t even bother eating real lunch, just nibbling a few biscuits. Dance really seemed to feed him. After the break, we were learning an excerpt from the répertoire of Pina Bausch until the end of the day. Dominique was teaching us a variation from Masurca Fogo, a piece by Pina Bausch inspired by Lisbon. There is a movement at some point where we put our closed fist on our forehead. Dominique showed us the exact position of the hand. He then moved his fist a few centimetres up and said: “If you put your hand there, it conveys a different message.” He went back and forth between the two positions to let us appreciate the difference of meaning. Pure genius pedagogy. Dancing with Dominique for a week equalled ten years of regular training. 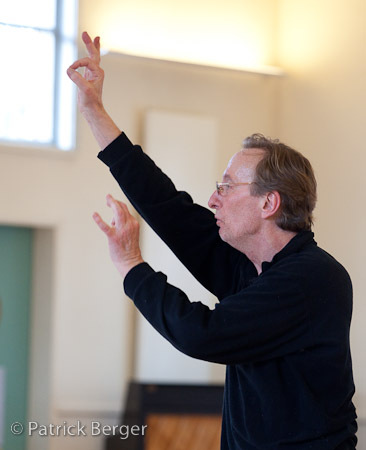 What is striking about his teaching is that absolutely everything makes sense, just like a choreography by Pina Bausch. The roots and reasons behind every single prop or gesture are thought of just like in the science of our dreams. The body and the psyche are coordinated together so that the spectator can actually relate to it. It resonates with everyone, because it has been thought of over and over again until it is charged with signification. There is nothing random or abstract about the language of Pina Bausch, that’s why her success as a choreographer was so huge across cultures and millions of people could identify to her dance-theatre. That dance language is so clever. It was moving to observe Dominique from so close, to watch his legendary arms. He was filling the space in an impressive manner. His resemblance with Pina Bausch only stroke me in the studio. I hadn’t realised by seeing him on stage how much these two looked like dance twins. No wonder they found and recognised each other instantly. The last day of the workshop, the rehearsal was opened to the public. Some people of the press were there alongside some anonymous lovers of Pina Bausch. It wasn’t a formal show but an intense and captivating work session like we had been doing the whole week. I wanted to go and talk to Dominique at the end of the performance, saying I don’t know exactly what, asking how I could get involved with the company, something along those lines. But I didn’t. I didn’t see the point after all. I wasn’t sure of myself. I lacked courage. Instead, at the end of the show and of this magical dance week, I got introduced by a friend to the girl who was going to become my girlfriend. She had just arrived in Paris for a few days. “Congratulations!” she said as she kissed my red and sweaty cheeks. A new chapter of my life instantly opened as the last one was barely closed. Fate and its mysterious timings. 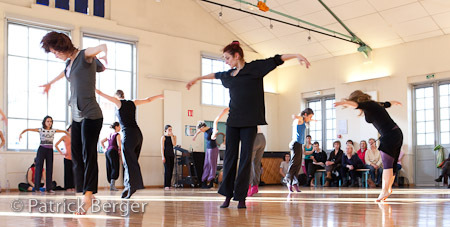 The pictures of the workshop are the property of Patrick Berger, photographer. I am the little blonde dancer at the far right on the last picture, in the purple tights.